Pre-paid for a workshop? Click the link below to schedule your workshop. Select your time/date/activity, enter customer details, type "prepaid" into box when prompted for payment info(you will be asked for your receipt or voucher upon arrival). Zen Glass offers fun, one-hour workshops for beginners. Make wineglasses, beer glasses, pendants, ornaments, paperweights, or beads! Zen's helpful staff will assist you every step of the way. Workshops range in size from 1 to 6 people. 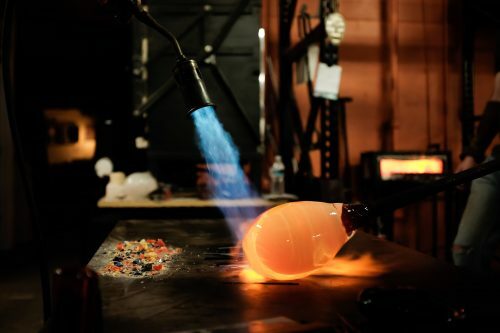 Join Zen Glass Studio every second Saturday of the month from 5pm to 9 pm for glassblowing demonstrations, gallery sales and wine! The glass gallery will be open and you can find work from resident artists, Dave Walker and Josh Poll, as well as glassblowers from around the world.